The case against the irrational. Ten "blogs" were published simultaneously on Saturday 15 June 2013, regardless of what date Google "Blogger" gives them. Google indiscriminately changed dates on some, but not others, when they were edited for minor corrections. And, as I required all of these blogs to appear in a certain order I "re-edited" all of them so that they would appear in the order I wanted… though Blogger re-dated some, but not others. How can an association of "racism" ever be made in the criticism of doctrine? what purpose could such an association serve? what logic could justify an association of doctrine with race? and why would any such association involve "Palestine"? Yasemin Shamsili, spokesperson for Students for Palestine, above, supports violence undertaken against those with whom she disagrees. 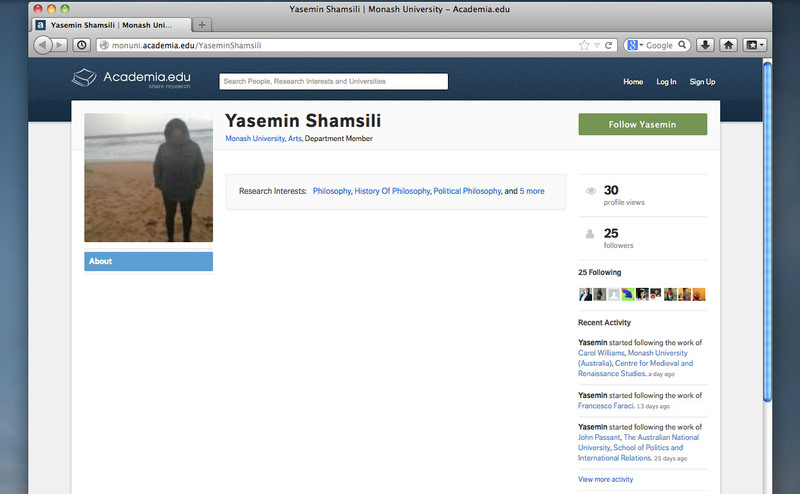 Yasemin Shamsili is pro-"Palestinian", and a liar. Students for Palestine is a university student union, which like the univertsity student unions of early 20th century pre-Nazi Germany, is making the hatred of Jews "respectable" and "rational". "Palestinians" wage a war guided by Islamic doctrine (Koran and hadith) against Jews. To prevent blame from being attributed to the "Palestinians" who are guided by Islamic doctrine (Koran and hadith) Students for Palestine denounce critics of Islamic doctrine as "racists". In 2009 on the opening night of my exhibition Humanist Transhumanist, in which I critiqued religion, I was described as "racist" by Robert Cripps, pictured, because I included in my critique of religion, criticism of Islam. Other religions critiqued, Christianity, Judaism and Zoroastrianism, though, were not deemed "racist" by Cripps. Robert Cripps, pictured above, was the owner of the failed Guildford Lane Gallery. Cripps' claim was that criticism of Islamic doctrine constituted "racism". He said it was because, as he admitted, he hated Jews; and that the quotes from the Koran made it evident (at least to him) that Jews are victims of Muslims vis-a-vis Palestine, despite no reference to "Palestine" being made anywhere in the exhibition in any form what-so-ever. Cripps wanted it to be otherwise. People like Cripps would rather blame the Jews for a conflict called for by a religion, Islam, in which a believer's duty is a "human right" to act in the way prescribed by doctrine. People such as Cripps, motivated by their hatred, have to have mention of and reference to, Islamic doctrine suppressed. They would rather hate the Jews and blame them. If quotes from the Koran (c. 650 AD) or the hadith (c. 850 AD) can be suppressed, then those who, because they are racist and hate Jews, can claim to have a justified hatred of the object of their hatred, Jews, vis-a-vis the "Palestine" issue ….an issue which came about after the creation of Israel (in 1948 AD), even though the doctrinal urgings followed by Muslims with regards to the "Palestine question" predate Israel by well over a millennium. That is, such people are racist, and can only blame Jews if they can suppress open discussion of Islamic doctrine. It is necessary to instill in the minds of the Moslem generations that the Palestinian problem is a religious problem , and should be dealt with on this basis." There is no ambiguity. This is a war demanded by Islamic doctrine as a Muslim's religious duty. Israel has nothing to do with it, other than its existence causes Islam affront. However, Jews can successfully be blamed for a religious war waged against them by making taboo any and all references to the Koran and the hadith. Suppression of knowledge of Islamic doctrine is successfully accomplished by calling "racist" those who might make available to others knowledge of the contents of the Koran, or the hadith. PRO-PALESTINAINS, the case against Yasemin Shamsili; how to make false accusations. An effort supported and sanctioned by the different apparatus of the state in Australia (which includes the universities and courts) intend to limit criticism of Islam to allow for blame regarding "Palestine" to be apportioned to Jews. The "question of Palestine", though irrelevant, arises whenever criticism of Islam is made. It did so recently in Melbourne in 2013, and it did so during our exhibition in 2009. If you prevent people from knowing what is written in the Koran or the hadith, then the people will make decisions on what they already do know, the Old Testament, and conclude that "the war in Palestine" is symptomatic of the Jew's need for "Old Testament vengeance" which is how Adolf Hitler put it. Yasemin Shamsili, above, blames the violence of her own supporters on those against whom the violence was done. 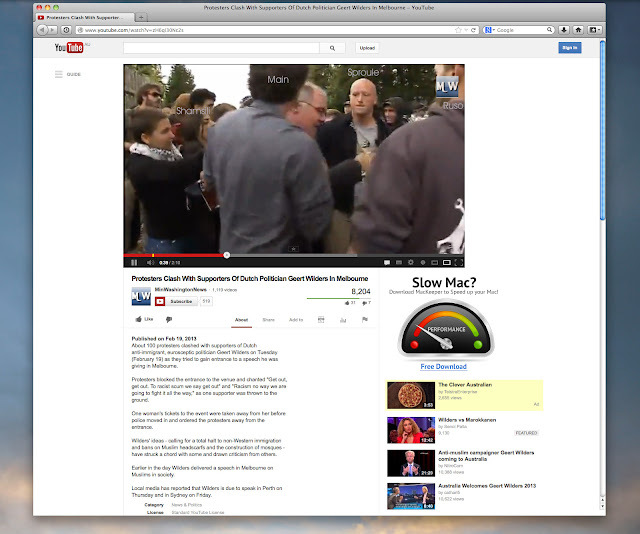 above, still from anti-Geert Wilders protest posted on YouTube. Shamsili of the "Students for Palestine" group can be seen between Yarra Socialists Gregson and Main. 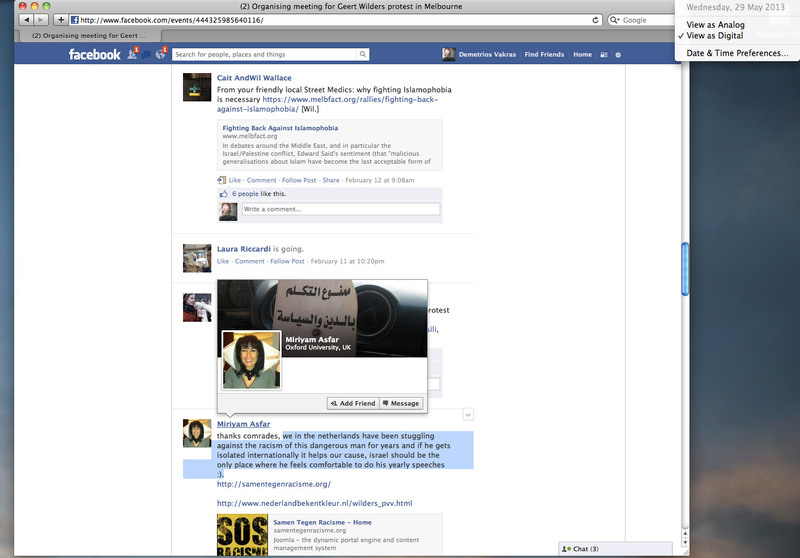 Gregson was invited to the Students for Palestine protest via Facebook and had accepted. above, still from anti-Geert Wilders protest posted on YouTube showing Shamsili of the Students for Palestine yelling. Yarra Socialist Main (fore) and Sproule (rear). Alex Sproule was invited by Students for Palestine to attend the protest on Facebook. His response to this invitation was "maybe". 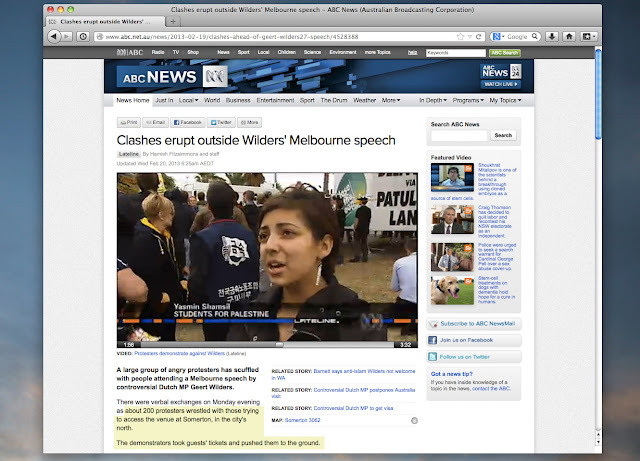 The footage clearly shows Shamsili standing alongside Yarra Socialist Party members, and Yarra Council candidates obstructing entry to those seeking to attend the Geert Wilders speech. It was Sahmsili's associates who were forcibly removed by the police, not the people who came to hear Wilders. Shamsili has lied and blamed the victims for what her associates did. It is the associates of Shamsili who are filmed charging at, and pushing, prospective attendees to the ground. It is the protesters who obstruct the path of the prospective attendees. It is the group Shamsili is with who are doing the “hurting” to others. The violence condemned by Shamsili is the violence perpetrated by her own group. Shamsili herself can be seen yelling at people. Shamsili is NOT "just standing there" as passive observer. By grabbing people and throwing them to the ground, the demonstrators do not constitute a definition of "just peacefully trying to raise awareness” as Shamsili claims. Shamsili is supporting the use of violence against people who were clearly not violent, by claiming that the perpetrators of the violence are instead the victims of the violence. 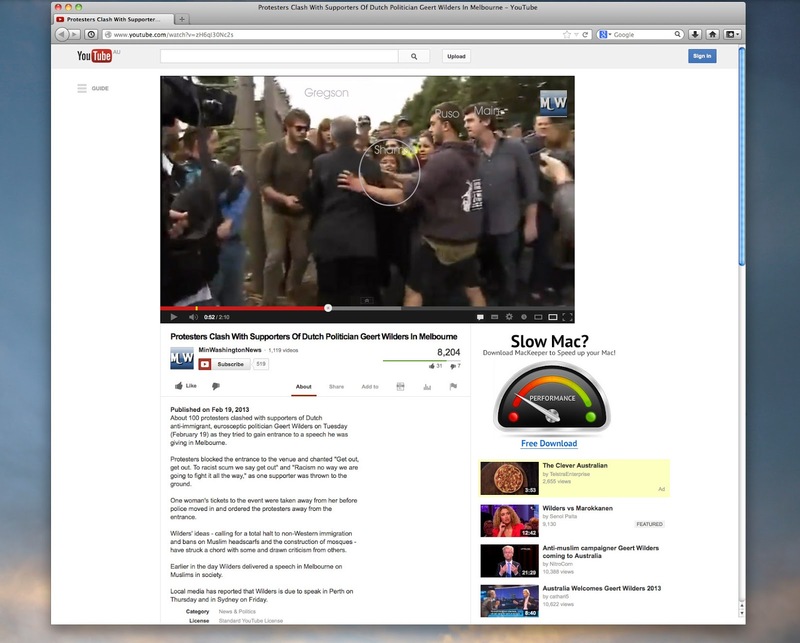 Protesters wrestling those trying to access the venue cannot accurately be described as wrestling “with” each other. This was one group acting against another who were its victims. 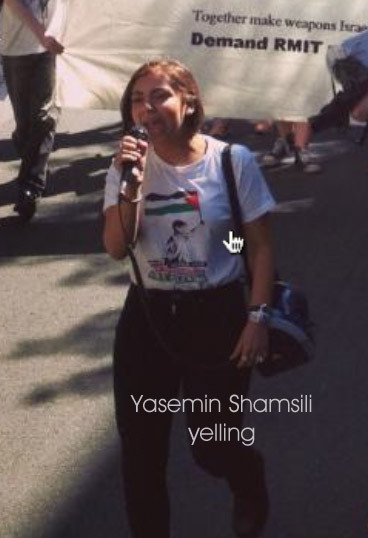 The objective in Sahmsili's exercise, is evident by what transpired and the lies told by her on behalf of the Students for Palestine in which violent acts are undertaken and then blamed on the group they attacked, accusing them of being violent instead. The readiness shown to accept that critics of Islam are violent because violence is used against them is seriously disgraceful, and shows that there is a willingness to hate simply for the sake of it. Shamsili is no stranger to anti Jewish rallies. She partook in a rally organised by the Students for Palestine that marched from RMIT to the State Library, in which her associate, known as “Delinquent” referred to those against whom she campaigned as “vermin”, reminiscent of anti-Jewish Nazi propaganda. Though Geert Wilders' speech concerned Islam, his opponents such as Miriyam Asfar (above), who appears to share some role in the organising of the anti-Wlders protest, claims that the intention of protest are to isolate Wilders internationally so that he will only ever feel comfortable in Israel. Why is criticism of Islam seen as proclamation of "pro-Israel"? Obviously such protests intended to prevent any investigation of the role of Islam has as the source of violence because such people believe that only the Jews should be blamed and be vilified. The Students for Palestine and their supporters are racists. The accusation of “racist” used against anyone criticising Islam - has become de rigueur in countries such as Australia and England. 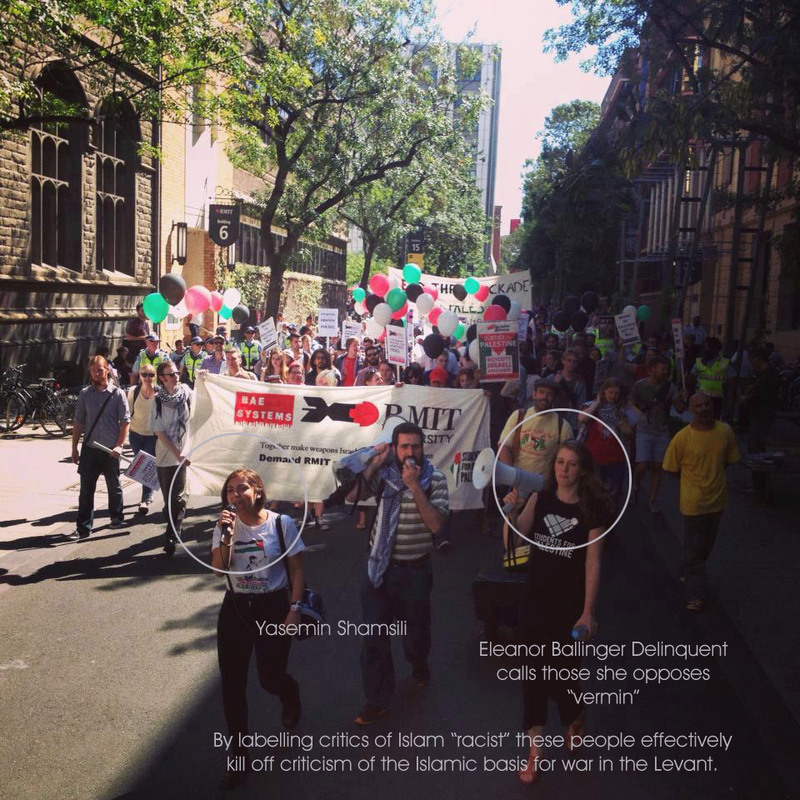 Cripps, like the “Students for Palestine” protestors, made accusations such as those made by Shamsili, in which he alleged “heated exchanges” occurred between he and us. Like the Students for Palestine it did not matter that it was he alone who was heated, angry and aggressive. Our dispassionate, rejection of his allegations however have been misrepresented, in the same manner as the Students for Palestine group, who misrepresented the target of their anger as being co-perpetrators simply because they were on the receiving end of aggression. There is a desire to label any critic of Islam to be predisposed to violent or aggressive behaviour; and so acting either violently or aggressively toward a critic of Islam is misrepresented as being an attribute of both parties. 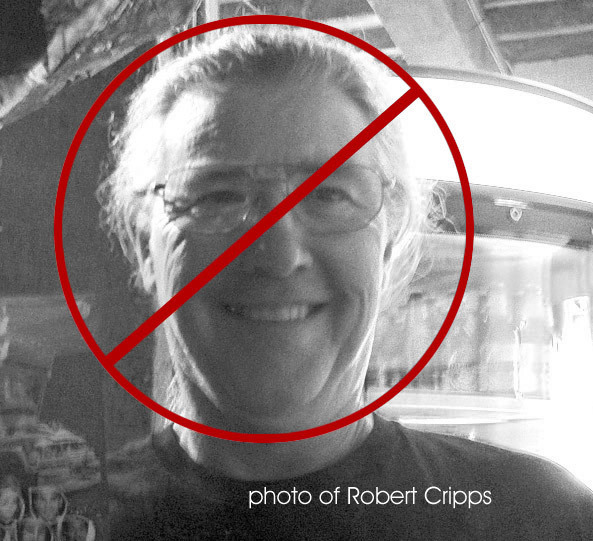 Liars such as Robert Cripps and Yasemin Shamsili project their violence and hatreds onto others. And this country's legal apparatus has, to date, shown itself to be complicit. 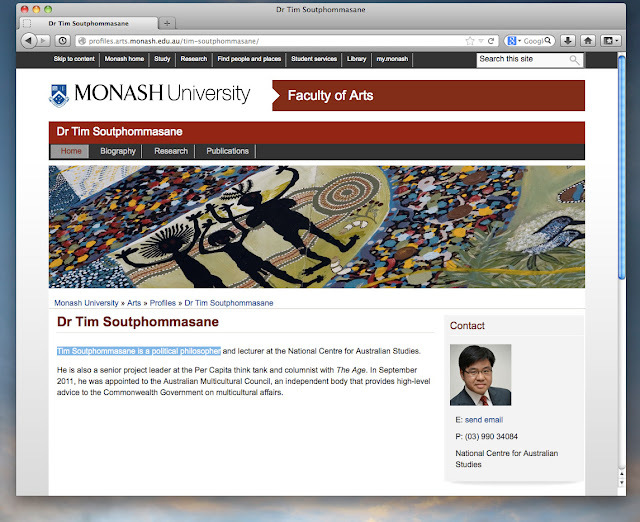 Melbourne tabloid newspaper, "the Age" columnist, Soutphommasane is an accademic, and political philosopher at Monash University according to his Monash University page (see below). Soutphommasane wrote to criticise Wilders and praised as “tolerance” the actions of those protesting against Wilders who threw people to the ground. When Adolf Hitler expressed "his" sentiments in Mein Kampf, they were the sentiments that had been made respectable by pre-Nazi German academics and university student unions. A similar path is being followed today in Australia by its own academics. No comments allowed? If you are passionate and want to comment, there is nothing that prevents you from writing your own blog. I have a disdain for the kind of commentary made by those who hide behind an avatar. I rejected the concept of "god" as an absurdity at age 7. The logical fallacies that constitute the desire to believe in that which is not, that which cannot be, and which can never be - "god" - do not become less fallacious as time progresses. However, in 2001 some intensely pious god-believers, who faithfully followed their religious doctrine committed mass murder on behalf of their fantastic delusion of god (fantastic = fantasy). Suddenly post "9/11" atheism was racism if criticism of religion included in the ambit of that criticism, criticism of the fantastic delusion of Islam. Apparently Allah, a being who exists in the fantasy of one branch of theists, is a god who though unable to exist in the realm of logic, is beyond criticism. This too was once Christianity's stance; protecting a chimera capable of being destroyed by the light of reason who needed protection from reason. Until 2001 I was an atheist with leftist inclinations. After 2001 I, as atheist, have been declared "far right" and "racist" by critiquing Islam, as if it is somehow different. The god-fantasy remains a fantasy regardless of whether the fantasy is called Allah, YHWH, Christ or Ormazd. Racist to criticise Islam. Really?